10.10.2014. 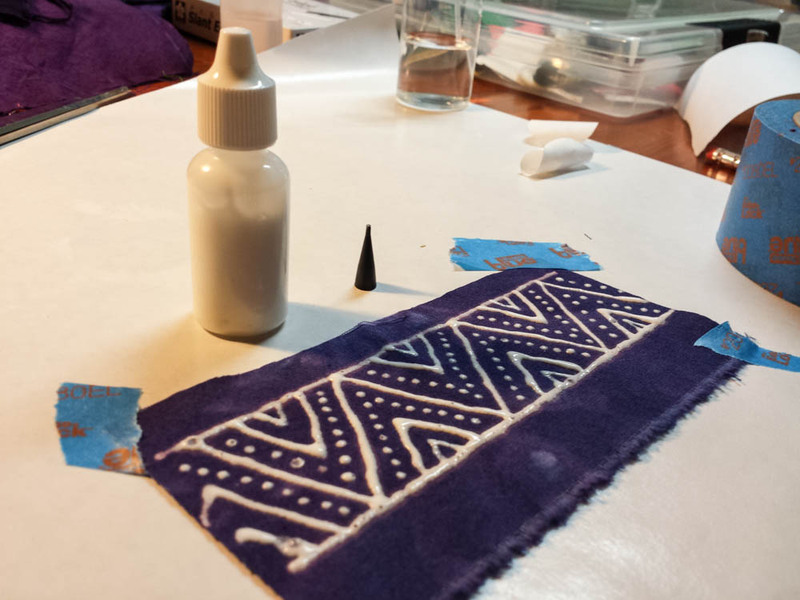 Did you know... That you can iron down the shiny side of grocery-store freezer paper to make a stencil on cloth? That art stores sell little teensy plastic squeeze bottles with very fine little nozzles? That Soft Scrub With Bleach (cream not gel) makes a great "discharge paste" to bleach designs into cotton? Micro project #1. Cut circles out of freezer paper. 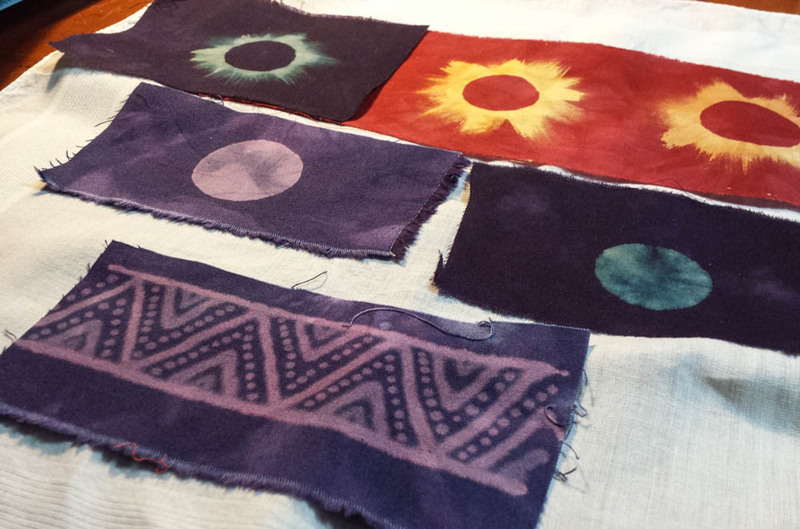 Iron circle (shiny side down) to dry colored cotton. Plop some SoftScrub into the center of the freezer-paper circle and, with a stiff brush, brush it outward onto the fabric. When color starts fading (1-5 min), run the scrap of cloth under cold water. Whoa! Eclipse! Micro project #2. Take the freezer paper minus the circle you cut out and iron it (shiny side down) to dry colored cotton. Run a line of Soft Scrub around the circumference. Brush it from the paper into the circle till the cloth is saturated. 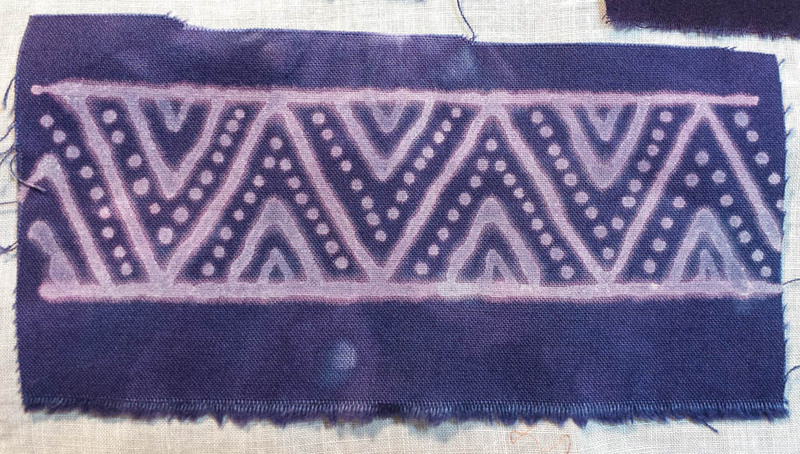 When the color begins to fade (1-5 min), run the scrap of cloth under cold water. A moon! *I took the Craftsy course with Jane Dunnewold but when I got her book Complex Cloth,it seem to take a whole different approach. Colour on Cloth by Ruth Issett provides a jumble of methods -- inspirational photos but her instructional approach is overwhelming.